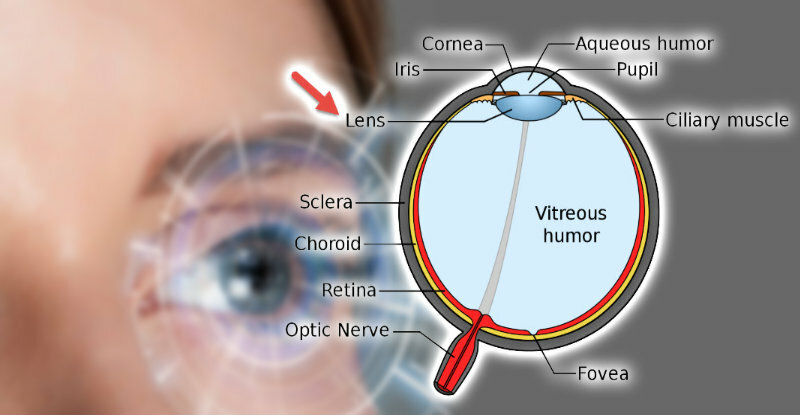 The lens of the eye is a transparent crystalline structure located directly behind the pupil. It has 9-10 mm diameter. 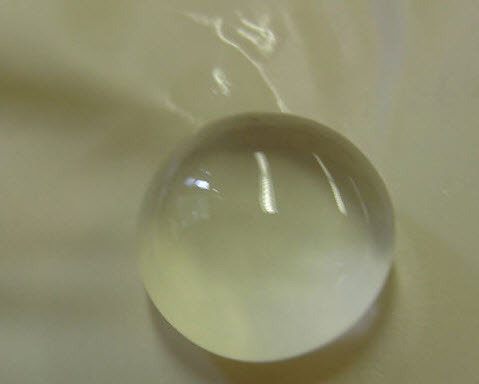 The eye lens is like a crystal and consists of water and proteins. 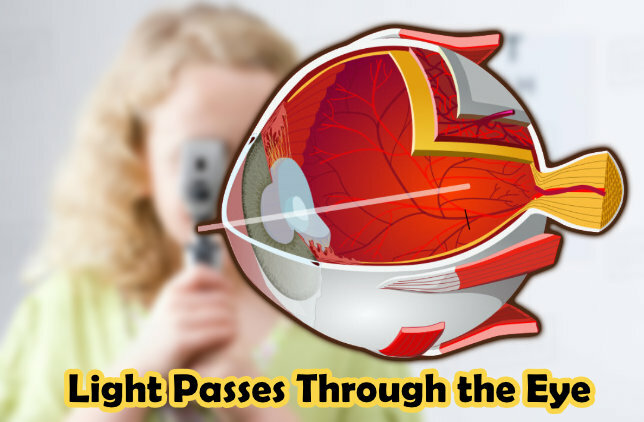 It is normally transparent to allow light rays to pass to the retina. It is also called the crystalline lens. The image below shows the lens of a calf eye removed and sitting on the palm of a gloved hand. The lens of the human eye looks the same as this lens. Light rays entering from the pupil pass directly to the lens. If you have contacts, it would penetrate even the famous brand of colored lenses. The image below shows the lens location directly behind the pupil. 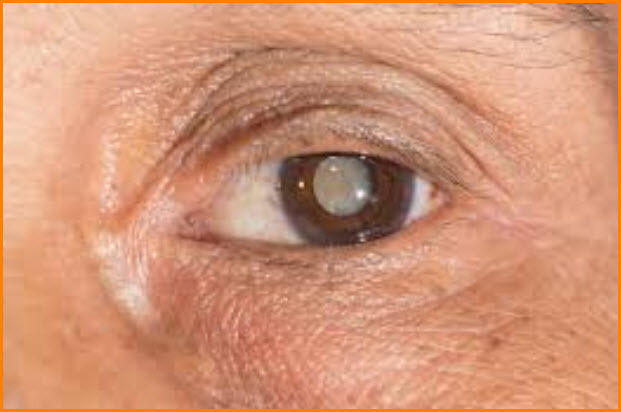 The lens in the image is of a person has a cataract, and it appears white in color. In normal people, the lens is transparent. And no, that is not a result of buying lenses at a cheaper price! The main lens function is to refract “bend” light rays and focus them in the eye. It shares this mission along with the cornea. The lens of the eye represents about one-third of the whole refractive power of the eye. Normally, the lens has fixed power to focus all parallel light rays (coming from 6 meters distance or further). All light rays coming from 6 meters or further need the same power to refract and focus them. Accommodation is the adjustable change of lens power in order to focus diverge light rays (entering the eye from less than 6 meters) in the retina. The lens shape is changed to adjust the power of the lens. There are suspensory ligaments of the lens (also called ciliary zonules) attach the eye lens to the ciliary body (which contains the ciliary muscle). They extended (like ropes) from the ciliary body and attached to the equator of the eye lens. These hold the lens in position and enable the ciliary muscle to act on it. The image below illustrates how the lens is attached to the ciliary body (which contains the ciliary muscle). When a light ray entering the eye from a less 6-meter distance or further, the ciliary muscle is relaxed, and the zonules are in a stretched configuration exerting tension on the lens holding it in the unaccommodated state, such that the image lies on the retina. When a light ray entering the eye from less than 6-meter distance, the eye needs more refractive power to focus them on the retina. This happens by as the following: the ciliary muscle contracts, the ciliary zonules loosen, and the lens thickens and become more curved, resulting in a rounder shape and thus high refractive power. This contraction of the ciliary muscles increases the lens power by the appropriate required amount. The more the contraction, the more increase in the refractive power of the lens. Is Becoming A Clinical Herbalist In Your Future?